State funeral for Zambian president Jump to media player Tens of thousands of Zambians attend a state funeral for President Michael Sata, who died last month in a UK hospital at the age of 77. Mixed views on Zambian interim leader Jump to media player People in Zambia's capital Lusaka give their views on the appointment of Zambian Vice-President Guy Scott as acting leader following the death of President Michael Sata. 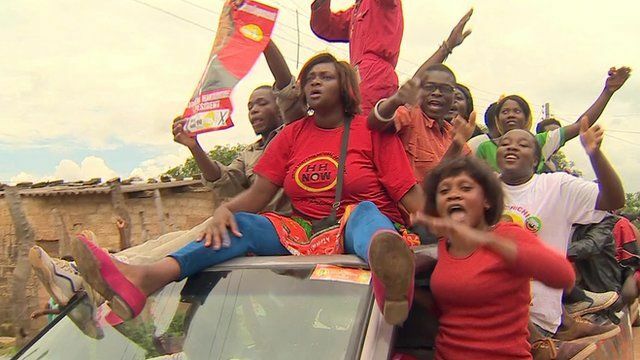 New leader for Zambia - in 15 secs Jump to media player Zambian Vice-President Guy Scott is named acting leader following the death of President Michael Sata. Here's the story in 15 seconds. Zambian President Sata dies in UK Jump to media player Zambian President Michael Sata dies in a UK hospital, becoming the second president of the country to die in office. Zambia's five leaders in five decades Jump to media player BBC Africa looks back at Zambia's first five decades through its five presidents. Voters go to the polls in Zambia's presidential elections on Tuesday following the death of its leader Michael Sata last year. There are four candidates taking part in the election. Nomsa Maseko reports from Lusaka.